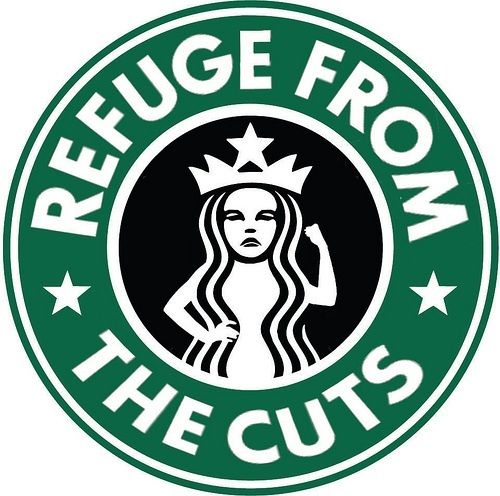 UK Uncut will transform tax-dodging Starbucks’ two flagship stores into the vital women’s services being destroyed by the government’s unnecessary cuts. Together we will fight back against the attack on women’s access to work, services and financial independence. GET INSIDE EARLY because we’ll be starting at MIDDAY ON THE DOT. Bring your own coffee. Plus anything else to complete the transformation, e.g games, face paints, felt tips, cake, your sleeping bag, legal info. One of Starbucks' flagship stores will be transformed into a refuge because £5.6m is being directly cut from domestic violence services. The potential destruction of refuges for women escaping abusive relationships is horrifying. Two women die every week due to domestic violence, a number which is set to rise if these cuts go ahead. Another of Starbucks' flagships stores will be transformed into a crèche because the government is cutting 25% of funding for Sure Start services. With already 100 Sure Start centres closed since 2010, cuts to benefits and affordable childcare will force thousands of women out of work to look after their children. So don’t forget to bring the kids! We’ll be here until around 2pm. This store has step free access. The cuts are not necessary. The government is making a political choice to slash public services and sell what’s left to private companies, rather than clamp down on tax avoidance by companies like Starbucks. This only benefits a rich minority. Let’s take action and show there are alternatives to the cuts. If you can’t make it to Regent St, well there’s loads of Starbucks in London, so why not organise an action in your local branch!